Animal Farm is a political allegory of the history of the USSR written in the form of a fable. Its stinging moral warning against the abuse of power is forcefully demonstrated in this casebook through a wide variety of historical, political, and literary documents that are directly applicable to the novel. Included are passages from the Soviet press; excerpts from personal memoirs and correspondence; original translations from Russian and East German sources that show the meaning of Animal Farm for those nations' readers; and historical and political sources on Marxism, the Russian Revolution, the Cold War, and Glasnost. Many of these documents have not been available in print before. 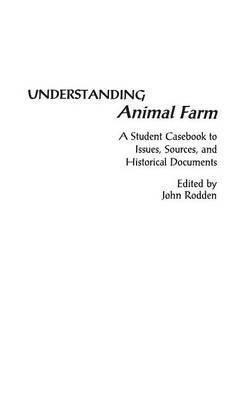 Following a literary analysis of Animal Farm, six chapters examine the historical, political, and literary issues raised by the novel. Chapters include selections relating the novel to basic tenets of Marxism, the Russian Revolution and Josef Stalin, the relation of George Orwell's life to the writing of Animal Farm, the Cold War, book reviews of the novel at the time of its publication, the American intellectual climate, and recent responses to the novel in the light of Glasnost and the collapse of the Soviet Union. Each document is preceded by an explanatory introduction, and each chapter concludes with suggested topics for written and oral exploration. This rich source of materials is ideal for interdisciplinary study of the novel.